One of my e-newsletter subscribers sent me a note the other day and asked if I had any tips for diabetic-friendly drinks. He said he was having trouble kicking a hard-core soda and juice habit. I remember what it was like to trundle down to the vending machines at work around 2 p.m. every day for my Coke® and M&M’S® fix. Once I found out I had diabetes, it was a habit I had to break. And it wasn’t easy. Sixteen years later, my beverages of choice are hot green tea in the morning, unsweetened iced tea for lunch, and water the rest of time. But it did take me a while to get to the point where I no longer craved sugary drinks. Cut back slowly. If you currently drink two sodas a day, cut back to one. Do that for a while, then go to one every other day. Keep cutting back until you can live without it. Diet soda may be worse for you than regular soda and diet soda drinkers tend to be more overweight than regular soda drinkers, so I don’t recommend switching. 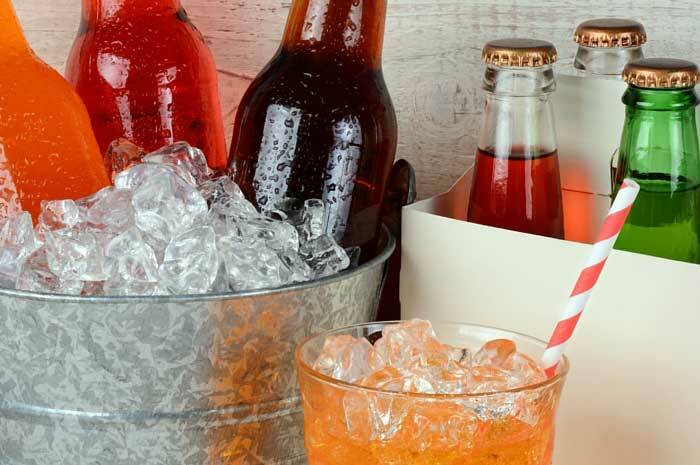 Both types of soda have been linked to tooth decay and fragile bones. Stop drinking soda, period. Dilute juices and sports drinks. If you drink a lot of juice, first make sure it is 100% real juice and doesn’t contain added sugars. Slowly start mixing the juice or sports drink with water or mineral water. Try a 75/25 mix, then a 50/50 mix, then a 25/75 mix. Finally, just drink the water with slices of citrus fruit, cucumber, or mint. You might also want to try Thyme Lemonade. If you miss the fizz of soda, try mineral water or club soda. Add slices of lemon, lime, or orange. Put a sign near your refrigerator that says it would take 5 miles of walking or 50 minutes of running to burn off the calories in just one 20-ounce soda. Start drinking unsweetened tea. Use a little sweetener at first, if you need it, then slowly phase it out. Use fresh mint sprigs or lemon slices as flavorings instead. Citrus Tea with Hibiscus and Goji Berries is also good, but the ingredients can be hard to find. You could also make Spiced Ginger Tea and chill it. When you crave soda or juice, drink a glass of water first to see if it quenches your thirst. The act of drinking something might curb your craving. Try Citrus Spa Water. Fill a bottle with water or unsweetened iced tea and take it with you when you’re in the car. If you get thirsty, drink from the bottle instead of stopping at a convenience store for soda or juice. If you have a tip for someone trying to kick a soda or juice habit, please share. Thanks, Mary Frances! What are your favorite drinks?